We are a family run business located in Folkestone, Kent. 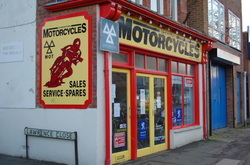 We have been serving the local Motorcycling community in Kent for over 30 years. On our Motorcycling and Scooter web site, we aim to bring you a comprehensive, up to date list of our Motorcycles and Scooters, stock and services. Please browse our site, to see all we have to offer, from quality pre-owned motorbikes, to the latest in motor scooter design. See our full range of Motorcycling clothing and crash helmets. Look at our Motorcycling accessories page for all those extras. Please take time to have a look through our constantly updated Pre-owed Motorbikes and Secondhand Scooters page. We stock a wide range of quality pre-owned Motorbikes and secondhand scooters. Our collection of excellent secondhand Motorcycles and Scooters covers manufacturers including: Honda, Yamaha, Suzuki, Kawasaki, Peugeot,Aprilia, Triumph, Derbi and .Our fully equipped workshop facilities we able to repair and M.O.T. any motorcycles including Honda, Yamaha, Suzuki, Kawasaki, Peugeot, Triumph, Derbi and Reiju . Please use our contacts page for a quote or visit our workshop at Cheriton, Folkestone, Kent. All our pre-owned Motorbikes and secondhand scooters come with a full M.O.T. and limited warranty. To see our secondhand motorcycles in person, our pre-owned motorbikes showroom is based at, Cheriton Motorcycles, Folkestone, Kent. If you are looking for waterproof boots, gloves, waterproof trousers, waterproof jackets, leather jackets or full-length leathers, take a look at our motorcycling clothing page. Spada andViper supply our range of gloves. We stock both summer and waterproof winter gloves. If want to try on the clothing first come to our Showroom at Cheriton Motorcycles, Folkestone, Kent.